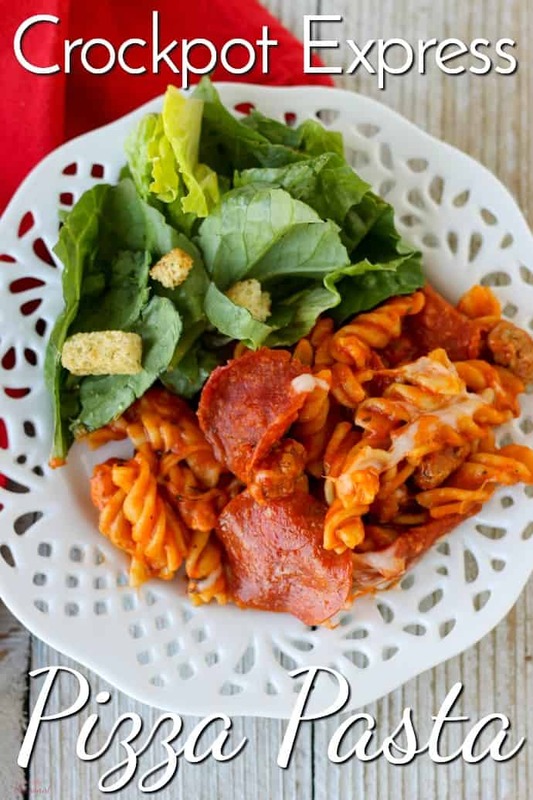 Crockpot Express Pizza Pasta is a family friendly dinner that you can easily adjust with your own favorite pizza toppings! Serve with breadsticks and salad for a satisfying and delicious dinner. When I first got my Crockpot Express, I didn’t think I’d ever use it for pasta recipes. Macaroni and cheese was the very first thing I tried, and I was not impressed. The noodles weren’t great and it actually took longer than it would to make it on the stove top. 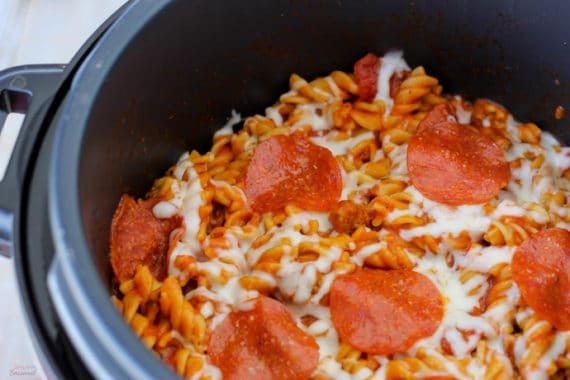 However, I’ve since realized that while it may not make sense to make a pasta side dish in a pressure cooker, making a hearty one pot meal like Crockpot Express Pizza Pasta definitely makes sense. My kids gobbled this up! (Naturally, since it basically pizza.) 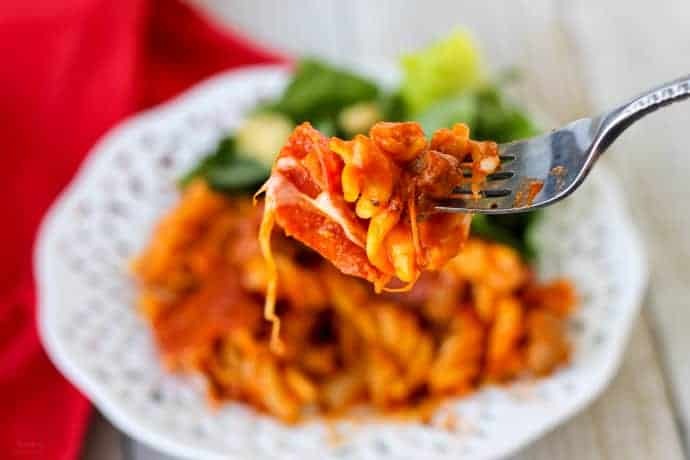 🙂 The best thing about this recipe is that you can totally tweak it to suit your tastes. Think of what toppings you like on your pizza and plug them in! If I’m making pepperoni and sausage, then I like to add mushrooms and olives. You could easily go Hawaiian with ham and pineapple, or even try a vegetarian pizza pasta. 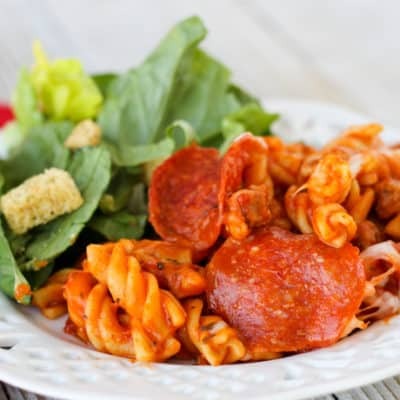 I saw this recipe for Instant Pot Pizza Pasta and used it as a guide for getting started with my Crockpot Express version. Our local grocery store has a pizza joint inside and they sell their pizza toppings in the deli section. I grab sausage and pepperoni there, and use pre-sliced olives and mushrooms to make this a really quick meal to prep without any pre-cooking. This also helps CPE users that tend to get errors when they use the Brown/Saute option before pressure cooking. Add the first 8 ingredients to the pot (everything but the cheese.) Set aside some pepperoni slices for later. Stir together to mix well. Close the lid, set the steam release valve to closed and press Steam (high pressure.) Adjust time down to 5 minutes. Press Start/Stop. When cooking cycle has ended, do a quick pressure release. Stir in most of the cheese, then add the rest to the top, along with the pepperoni slices that had been set aside. Close the lid for a couple minutes to melt the cheese. Open back up and press Start/Stop to turn off the Keep Warm setting. 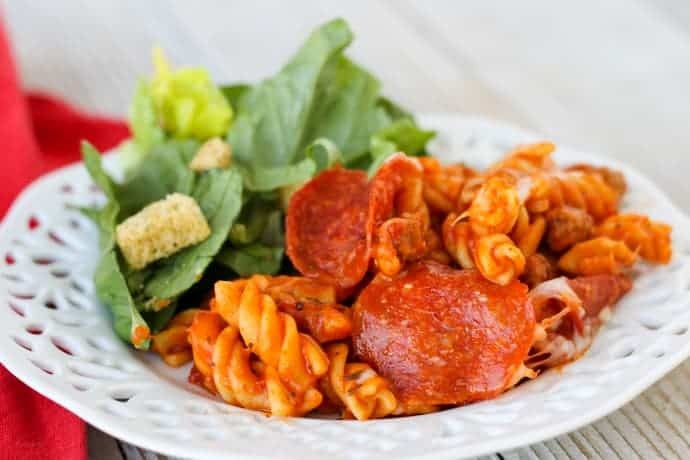 Serve with garlic bread and salad for a quick and easy meal! If you are using vegetables like onions, bell peppers, jalapenos, etc. and you like them soft, you can cook them in a little butter or olive oil on the Brown/Saute setting before adding the other ingredients. If you can't find precooked sausage crumbles in the deli section, you can buy a pound of Italian sausage and cook it on Brown/Saute before adding the other ingredients. We’ve already had this meal three times. I love that it’s so fast to prep and get on the table. The pot is quite full, so it takes a little while to come to pressure, but then the cook cycle is done in just five minutes and you’re ready to eat! Click here—>for more awesome Crockpot Express Recipes!